UNITED NATIONS, USA -- Russia blocked a United Nations Security Council resolution on Wednesday that would create a tribunal to prosecute those responsible for the downing of a Malaysia Airlines jetliner last year in eastern Ukraine. 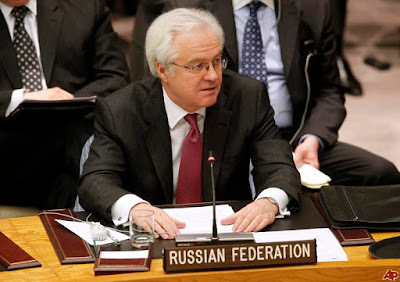 Russia’s ambassador to the United Nations, Vitaly I. Churkin. The measure was aimed at enforcing accountability for the downing of Flight 17, which killed all 298 people aboard. Many of the passengers were Dutch, and the Netherlands has been investigating the disaster. Russian officials had signaled their strong opposition to the resolution, which was introduced by Malaysia and drafted by a collection of countries, including the Netherlands, Ukraine and Australia. The vote in the 15-member Council was 11 to 1. Three countries — China, Angola and Venezuela — abstained. “We are deeply disappointed,” said the Malaysia transport minister, Liow Tong Lai, who attended the Council session and spoke in support of the resolution before the vote. Russia, one of the five permanent members of the Council, along with Britain, China, France and the United States, has veto power over any resolution. Explaining the veto, Russia’s ambassador to the United Nations, Vitaly I. Churkin, said his country wanted a “rapid determination of guilt” for whoever was found responsible. But he also questioned the impartiality of the tribunal envisioned in the resolution. “Can it resist propaganda?” he said. Ukraine’s government accused Kremlin-backed separatists of using a Russian-made missile to shoot down the plane, which was en route to Kuala Lumpur from Amsterdam on July 17, 2014. The jetliner plunged in pieces to a bucolic part of eastern Ukraine near the Russian border. Russia, which has suggested that Ukrainian forces may have been responsible, said the resolution had been politicized and that an investigation into the cause of the crash had not been completed.